Ely is a tiny town in Northern Minnesota that is perhaps best known to fans of the Boundary Waters as the gateway to canoe country. Pronounced EE-lee, this pleasant hamlet with a population of 3,460 is our last glimpse of “civilization” before heading into the wilderness and our first taste of it again upon exiting. Although there are several other entry points to the BWCA and Canada’s Quetico just north of the border, we always find ourselves attracted to this charming little town that comes alive in the summertime with canoe enthusiasts heading into the backcountry. We have been going to the Boundary Waters for years, but this is the first time that we intentionally scheduled a few extra days in Ely to explore some of the area’s non-canoeing attractions (beyond the requisite stop at the Dairy Queen, of course). We have some close friends—Joy and Jonathan—from Chicago who have a cabin just outside of Ely, and so we took advantage of the opportunity to spend a few nights with them. As luck would have it, Joy is also a docent for The Listening Point Foundation, which happened to be the number one place on Matt’s wish list of things to see. Listening Point is the rustic retreat of Sigurd F. Olson (1899-1982), longtime resident of Ely, avid canoeist, and conservationist who played an important role in the passage of the Wilderness Act in 1964, which was instrumental in protecting the Boundary Waters from logging. His cozy, one-room cabin located on a point on Burntside Lake a few miles outside of Ely was the place where Sig Olson would go to find peace, live simply and get away from the “big city” of Ely. It was here that he would listen to the call of the wild and plan his next adventure in what he called the Quetico-Superior country; it was also where he would gather his thoughts for what would become nine collections of essays that celebrate the power of wilderness to heal the ailments of modern society. We were fortunate to have Joy guide us around the property as she told us anecdotes of Sig’s life. It was especially moving to sit inside the simple one-room cabin and meditate on Sig’s enduring legacy. We tried to capture its rustic essence with some HDR photography. We also spent a morning exploring the International Wolf Center which is dedicated to the area’s most elusive predator, the grey wolf. The Wolf Center currently has four adult wolves on exhibit, and we timed our visit for their daily feeding. Unfortunately, we just missed another big excitement of the day. As we drove into the parking lot, we could hear the pack howling loudly, but, by the time we paid our entrance fee and got to their exhibit, they were done talking for the day. Nonetheless, it was impressive to have heard their deafening howls so nearby! After an informative presentation about the wolves, one of the keepers brought out a deer leg, and we watched as the alpha of the pack snatched it up and carted it off to a corner of their exhibit to enjoy for himself. The other wolves must not have been very hungry or have become used to this routine because they didn’t seem particularly bothered by their friend’s greedy behavior. In addition to the live wolves, the Center has many informative exhibits about wolf ecology, conservation, hunting and various art forms—painting, sculpture, literature—featuring wolves. To our delight, we also found a temporary exhibit featuring Sigurd Olson’s connection to wolf conservation in the area. 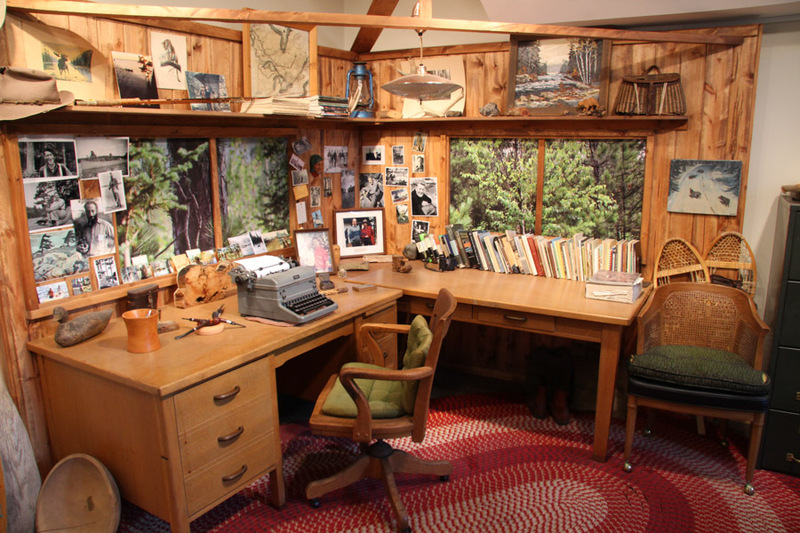 The exhibit included a replica of Sig’s writing shack where he penned his nature essays and also featured the impact that Sig’s efforts had on establishing not only the Boundary Waters, but also the Point Reyes National Seashore and the Arctic National Wildlife Refuge. We appreciated this additional glimpse into the life of the man who made such a large impact on this area that we have grown to love so much. Although the Boundary Waters is prime territory for black bears, so far we have been fortunate to run into only one in our trips into the backcountry. 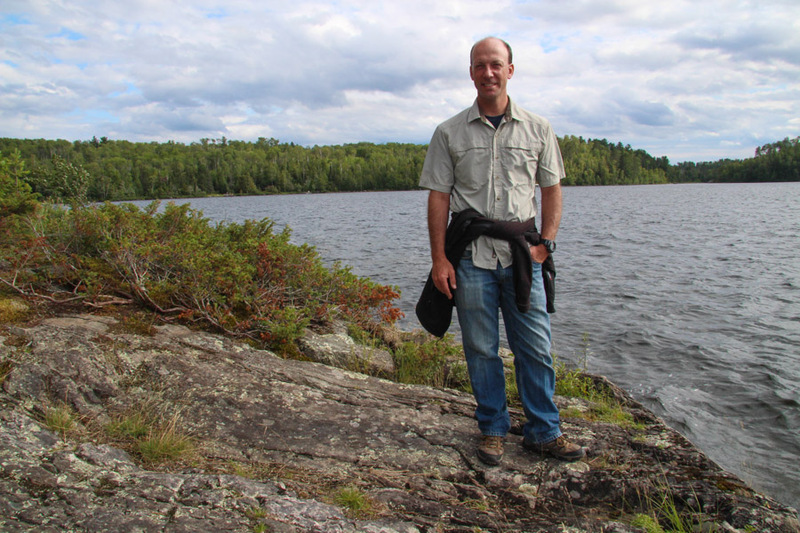 It was several years back now, and we were just about to enjoy our dinner on an island campsite in the Man Chain of lakes in Quetico. I distinctly remember enjoying the false sense of security that an island camp affords when we heard a splash in the water nearby and looked up from our meal to see something approximately 30 yards offshore and swimming directly toward us. At first, we just assumed it was a beaver or maybe even an otter, but, as it got closer, the shape of its large round ears made us realize we were clearly mistaken. I went into a minor panic and started pacing back and forth, muttering “What do we do? What do we do?” at Matt who calmly asked me to fetch the binoculars while I was up! Luckily, the bear turned back as soon as he saw us, which was our cue to pack up camp and move on to another site. It was an exciting encounter, but, as far as I am concerned, one bear sighting in the backcountry is definitely enough for this lifetime. A far more reliable and safe place to see a black bear in the area is the North American Bear Center. Very similar in purpose and mission to the Wolf Center, you can learn everything your heart desires about bears at this museum. They also have a few rescued bears on display and offer feeding times where you are more likely to see some activity on a hot summer day. The bear we saw clearly loved the frozen berries that she was fed. No trip to the Boundary Waters would be complete for us without a breakfast at the Chocolate Moose and a stop to drool over the outdoor gear at Piragis, a locally-owned, REI-type shop specializing in all things canoe. The two stores are attached, and we often head straight there for a filling meal right after coming out of the backcountry. Enjoying a huge plate of blueberry pancakes after eight days of freeze-dried meals is an experience not to be missed! For such a small town, Ely really does offer an attractive variety of things to do. We also enjoyed stopping into the exquisite gallery of famous, local nature photographer Jim Brandenburg. He has worked for National Geographic and became well-known for his “Chased by the Light” project in the days of film in which he captured the beauty of Northern Minnesota by shooting just one frame per day over the course of 90 days. His gallery is definitely worth a stop. On a future visit to Ely, we hope to visit the Dorothy Molter Museum, the Soudan Underground Mine and the Vince Shute Wildlife Sanctuary in nearby Orr. So much to do, so little time! We also made a point of exploring some of the state parks in the Duluth area on our way back to Chicago. 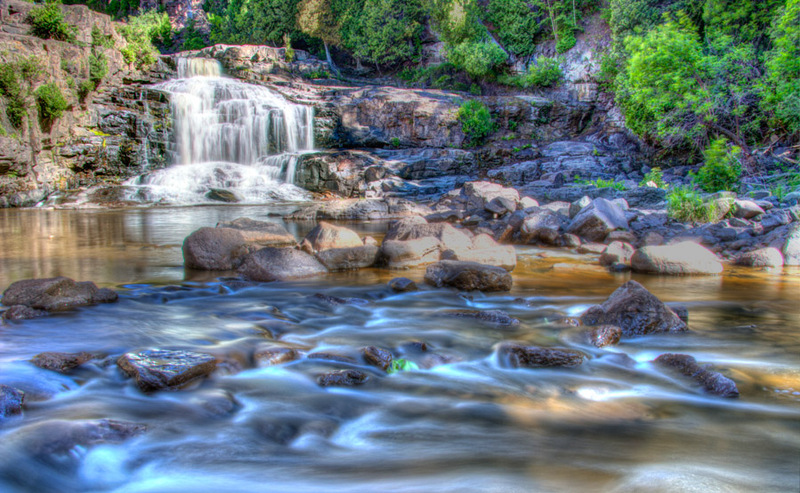 We were impressed with the waterfalls at Minnesota’s Gooseberry Falls State Park and Wisconsin’s Amnicon State Park. Both are certainly worthy of a stop on your way to or from the Boundary Waters. 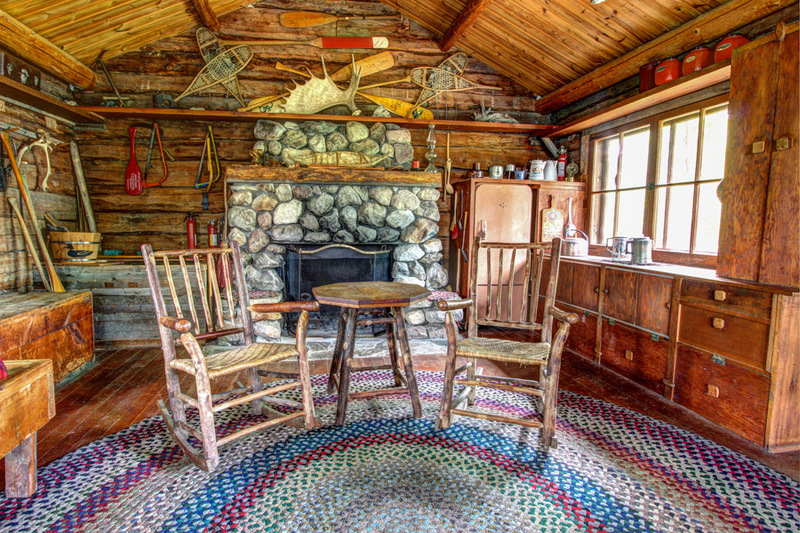 The pictures of Sig’s cabin look more like a painting than a real cabin. Very intriguing. And do go to the Vince Shute Wildlife Sanctuary next time. That’s the effect of HDR photography. It’s kind of fun because you never really know what the end result is going to look like. A trip up to Orr is definitely on the agenda for next time! Great post! Not many people realize that some of these little towns have much to offer (coming from a Haywardite). And a bear encounter? I would be pacing too! Thank you! We couldn’t agree more. Ely sure does offer a lot for its tiny size. And we didn’t even mention the cold-weather activities in the area. Matt is dying to do a yurt-to-yurt dog sledding/snowshoeing trip, which sounds like a ton of fun. Hopefully we’ll make it up there some winter soon! Hi Matt & Alison, What software did you use for your HDR photos? We use Photomatix for processing. It is really easy to bring in the bracketed photos. We aren’t too good at working all of the sliders, so we usually choose one of the preset filters available to get the look we like best. Have you ever tried it?